Some kids will be spending the summer hanging out with crawly critters, walking a highwire, creating video games or dusting for fingerprints. Day camps – no longer the stuff of just arts and crafts or swimming lessons – today offer youth an endless array of quirky skill sets, intersecting fun with new learning experiences. Bugs without Borders in Toronto, as one example, gives kids aged 5 to 12 a chance to interact with flying and buzzing creatures, including exotic insects and reptiles. They’ll learn all about what the bugs eat, how they live and how they spend their days. Trips include fields and ponds, to observe and collect various insects and amphibians. From mud and ponds to swinging in the air, there’s Circus Camp at Toronto’s Harborfront, for ages 9-14. Experienced circus professionals lead instruction that includes juggling, stilt-walking, acrobatics, highwire, trapeze, mini-trampoline and clowning. North of Toronto, at the McMichael Art Gallery, ArtVenture kids aged 5-15 partake in many streams of activities: sculptures, painting, science and art, animation, puppetry and instrument making. For the science inclined, there’s University of Toronto Mississauga Forensics Camp, for ages 9 to 13. Campers scour a crime scene investigation, dusting for fingerprints, collect and analyze clues and learn the science behind all of those CSI shows. Meanwhile, closer to home, at Vancouver’s Stanley Park, is Eco Detectives Summer Day Camps, for ages 7-11. 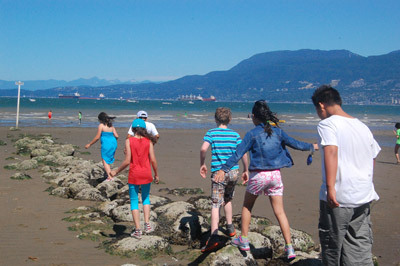 Kids can embark on an “exciting educational adventure amongst the giant trees, sandy beaches and hidden wetlands of Stanley Park,” according to the camp’s website. Pear Tree Education’s Summer Camp Vancouver, for ages 5-14, is at the learning centre in Kitsilano. Those aged 5 to 6 can make “flubber” and learn kitchen science; those 10 to 14 can learn graphic design; “Pear”formers ages 10 to 14 learn dance, musical theatre and acting; and Film Noir, for ages 10 to 14, includes screenings, creating a film and directing skills. Also local, run out of the Jewish Community Centre of Greater Vancouver, is Halutzim Youth Adventures camp, for those entering grades 5 to 8. Campers will explore adventures in waterslides, skim boarding, hiking and biking, as well as a four-day camping excursion. The JCCGV offers several other day camp options as well, for kids as young as 2.5 years old. Digivations, headquartered in Vancouver, offers a series of overnight and day camps, which teach youth about science, engineering, technology, cultural arts, creative writing and movement. At their 23-acre Leavenworth, Wash., camp, the summer overnight experience is dubbed Camp Demigod. “We create different imaginative projects based on what is current and topical,” co-founder Anne Deane Berman told the Independent. A third to a half of the overnight camp kids happen to be Jewish, she added, leading them to include Shabbat services. When the camps began six years ago, they had nine kids. To date, nearly 5,000 kids have participated, she said. Expected next summer is also Sci-Fi Fantasy and Theatrical Combat, for ages 8 to 14, focusing on combat swordsmanship, story-making and costume design. As it did last summer, this August at the JCCGV, Digivations is offering several day options, including LEGO+Arts Imaginerium, for kids 6 to 12, during which campers solve challenges through LEGO and rocket building, art projects and theatre. In Tsawwassen and North Delta, the organization is offering Camp Half-Blood as well as LEGO+Arts Imaginerium and a couple of other creative technology- and innovation-focused camps. Meanwhile, at the Innovation Academy and World Building Day Camp, students aged 10 to 14 create new inventions through the lens of alternative energy, ecosystems, transportation, genetics or synthetic biology. The camp also offers access to computer and virtual reality equipment. For something further afield, or at least much further east (and south), there’s Youth Digital in North Carolina, which offers kids ages 8-16 various technology learning experiences, such as App Camp, 3-D Game Design, and Animation. At the end of their session, campers will have created their own playable apps and games. While there are other courses offered with other companies in these categories, Sharp said they’re either simplistic drag-and-drop or college level courses, but, for youngsters, there are no other game design courses in between that require programming.